ACCRA, Ghana--Ghana has opened its own version of Japan’s fabled Hanshin Koshien Stadium thanks largely to a baseball-loving former Japanese high school player who is spreading the popularity of the sport around Africa. 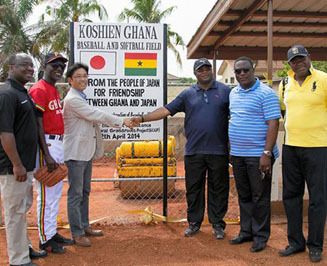 A ceremony was held April 12 to celebrate the completion of the Koshien Ghana Baseball and Softball Field at a school compound in Accra, the capital of the western African country. After a signboard with the name of the field was unveiled, a friendship game was held between Ghanaians and Japanese living in the country. It has since been used for baseball games and classes for children. The new field, the first full-scale baseball field in the country, stretches 120 meters from home plate to the center field boundary, and 105 meters each to right and left field. It does not have outfield fences but is equipped with a backstop and benches for both teams. Ghanaians hope their new field can generate the same kind of excitement that sweeps Japan when the national high school baseball tournaments are held at Hanshin Koshien Stadium in Nishinomiya, Hyogo Prefecture. They also want Ghanaian players to use the new field as a springboard for future success in professional leagues overseas. Tomonari, once a member of the Keio Senior High School baseball team, was a key player in efforts to build the new baseball field and use “Koshien” in its name. In 1996, when he was assigned to Ghana as a JICA official, he rarely saw local people playing baseball. Like other African countries, soccer was the most popular sport in Ghana. The Ghanaian children who did play baseball had to use empty lots or school fields. But Tomonari found there was enough interest in baseball to form the Ghanaian national team. In 1999, the team reached the semifinals in a preliminary African tournament for the 2000 Sydney Olympic Games. In 2003, Tomonari set up the Association for Friends of African Baseball (AFAB), a nonprofit organization based in Tokyo that continues to promote baseball in various parts of Africa. Seeing great potential in the young Ghanaian players, Tomonari in 2011 started a project to support the activities of the Ghana Baseball and Softball Association (GHABSA). He explained his approach to baseball to GHABSA members and showed them a documentary produced by a foreign media company about Japanese high school teams. The members applauded after watching the documentary. The Japanese Foreign Ministry agreed to provide about 10 million yen ($100,000) from its Grant Assistance for Cultural Grassroots Projects fund for construction of the Koshien Ghana Baseball and Softball Field. Tomonari obtained permission from the operator of the Hanshin Koshien Stadium to use “Koshien” in the name of the Ghana’s new baseball field. GHABSA President Albert Frimpong, 43, who used to be captain of the Ghanaian national team, has high expectations for the baseball field.